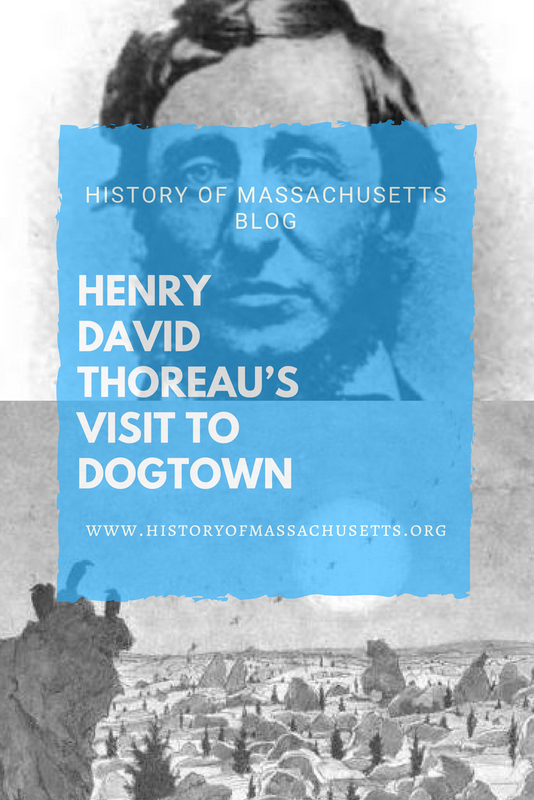 In September of 1858, Henry David Thoreau and his friend, John Russell of Salem, embarked on a walking tour of the North Shore which concluded with a stop at the infamous Dogtown settlement in Gloucester. “We kept along the road to Rockport, some two miles or more, to a ‘thundering big ledge’ by the road as a man called it; then turned off toward the south shore, at a house with two very large and old pear trees before it. Part of the house was built by a Witham, one of the first settlers, and the place or neighborhood used to be called ‘the Farms’… The narrow road – where we followed it – wound around big boulders. We had already seen a sort of bare rocky ridge, a bare boulder covered back of the Cape, running northeasterly from Gloucester toward Rockport and for some three miles quite bare, the eastern extremity of the Cape being wooded. That would be a good place to walk. At Annisquam we found ourselves in the midst of boulders scattered over bare hills and fields, such as we had seen on the ridge northerly in the morning, i.e., they abound chiefly in the central and northwesterly part of the Cape. This was the most peculiar scenery of the Cape. We struck inland southerly, just before sundown, and boiled our tea with bayberry bushes by a swamp on the hills, in the midst of these great boulders, about half-way to Gloucester; having carried our water a quarter of a mile, from a swamp, spilling a part in threading swamps and getting over rough places. Two oxen feeding in the swamp came up to reconnoitre our fire. We could see no house, but hills strewn with boulders, as though they had rained down, on every side, we sitting under a shelving one. When the moon rose, what had appeared like immense boulders half a mile off in the horizon now looked by contrast no larger than nutshells or burlnut against the moon’s disk, and she was the biggest boulder of all. When we had put out our bayberry fire, we heard a squawk, and, looking up, saw five geese fly low in the twilight over our heads. We then set out to find our way to Gloucester over the hills, and saw the comet very bright in the northwest. After going astray a little in the moonlight, we fell into a road which at length conducted us to town. Dogtown had long been abandoned by the time Thoreau stumbled upon it in 1858. The town’s last resident, Cornelious Finson, was dragged out of one of the cellar holes in February of 1839 and placed in the poor house in Gloucester, where he died seven days later. By the time Thoreau made his visit, Dogtown was nothing but boulders and cellar holes. 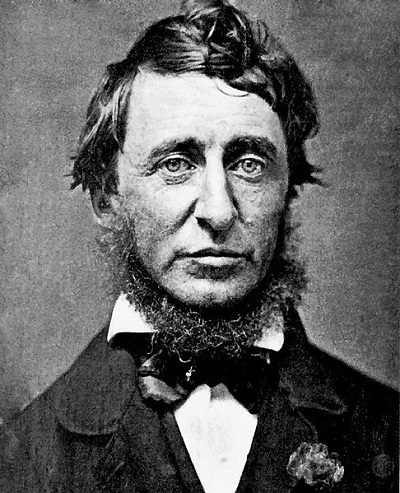 It was the last trip to Gloucester that Thoreau would ever take, as he lost his lifelong battle with tuberculosis just four years later on May 6, 1862. Thoreau, Henry David. The Writings of Henry David Thoreau in Twenty Volumes. Vol 15. Houghton Mifflin and Company, 1906.